There is never a good time for your washing machine to start acting up– it is essential to the daily running of your home. To save yourself from having to lug laundry back and forth from your home to a commercial laundromat, contact us to come and fix it quickly. At Central One Service, we are licensed and trained to diagnose the issues your washer may be having, and we can come up with a quick and efficient solution. No matter what make or model the washing machine, we’ve got the parts and expertise to get it working like new in no time! For over 35 years, we’ve been providing outstanding washing machine service, repairs & maintenance to Little Rock, Arkansas and the surrounding areas. Your washing machine can develop problems that range from simple troubleshooting to full repairs from a trained technician. While there is never a good time for your washing machine to have problems, you can still take action against these common issues before they turn into more serious problems. If you begin noticing that your top load washer or a front load washer is exhibiting any of these signs, call Central One Service right away. Not draining properly – Are you tired of opening your washer and finding your clothes still soaked, with perhaps even some water pooled at the bottom of the washer? When the washer is not draining properly, the problem could range from a simple clog in the drain hose to a faulty pump in need of replacing. Leaking water – When you have a washer that is leaking water, your first and only clue is the mess on the floor. This can be infuriating because it can lead to water damage of the other items in your basement on top of the strain of repairing or replacing the washer. A leaky washer may be due to many problems including the worn down hose washers, clogged drains, improper or unbalanced loads, or the hose not being attached. Detergent is not dispensing – In the case of automatic detergent dispensers, you can sometimes run into the issue of unclean clothes even after a full cycle. This might be because the detergent never dispensed in the first place. Typically when this happens, due to one of two problems: built-up residue within the dispenser or the detergent product is not correct for the unit. Noisy – Clicking, humming, gurgling…your washer can make a lot of loud noises. When this happens, it can be quite annoying to everyone in your house. The problem could lie in a clogged drain, a faulty part that needs fixing, or it could simply be a foreign object that shouldn’t be in there. Inside is smelly – The inside of a washing machine can be dark and moist– the perfect breeding ground for all manner of bacteria to grow. Once this starts to happen, it can develop a musty, moldy, or mildewy smell that can begin to permeate even your clothing. This can normally be solved by regularly cleaning the inside and always make sure to use the correct amount of detergent because excessive suds can leave residue which traps odors. Contact us for Little Rock Washing Machine Repair! At Central One Service, we have provided washing machine repair to Little Rock and central Arkansas homeowners for over 40 years. 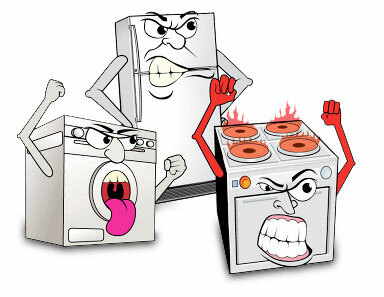 When you have a problem with your washing machine, contact us! We offer FREE service calls for repairs for all service calls during normal business hours. We’ll find the source of the problem and get your washer back in prime condition ASAP. Contact our team today!